Welcome to our gallery of beautiful backyard greenhouse ideas including DIY kits, designs and information on how to build your own. Growing your very own garden is exciting and beneficial. Seeing lush foliage, charming flowers in full bloom, along with bountiful crops gives off a certain amount of thrill that keeps you motivated to enhance your garden even more. However, existing conditions in the environment may sometimes prevent you from doing so. But don’t worry, because the perfect gardening companion is here for you – the greenhouse. 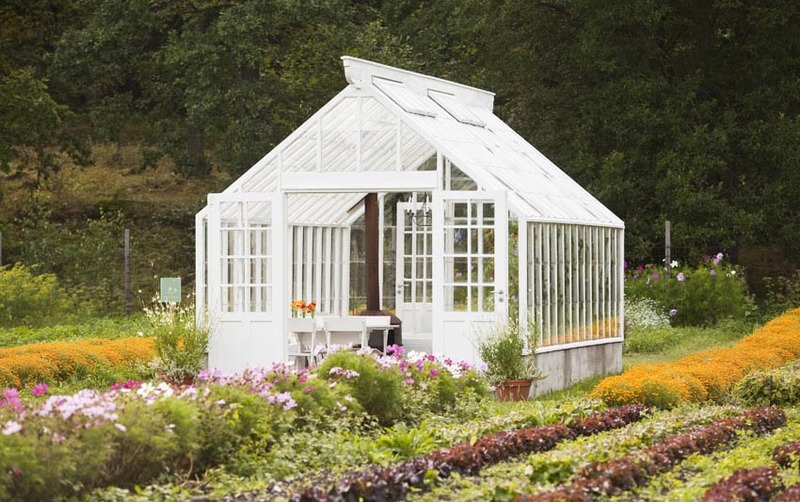 Read on as we share with you our ultimate guide on backyard greenhouse ideas and designs. The simple post and rafter greenhouse in the picture above is perfect for holding a small variety of potted plants and crops. It is made up of an aluminum framing system, gable roofing and an acrylic covering. The clear acrylic panels allows a view of the plants grown in the greenhouse, while also allowing sufficient sunlight to pass through. The primary purpose of a greenhouse is to act as a shield between your plants and the nature. Generally, it protects plants from harsh outdoor elements, insect infestation and diseases, allowing for an extension of the growing season by providing improved growing conditions for your plants. There are a number of advantages to using greenhouses for growing your plants. In this article, we help you break down each of the positive reason as to why you should get a greenhouse. Makes your garden extra interesting – A greenhouse with a wide varieties of plants offer an exhibition of different shapes and sizes offering an interesting focal point for your garden design. Extends the growing season for plants – A greenhouse offers a longer season, allowing you to grow plants even during the colder climates. Consequently, an extended growing season will enable you to maximize the produce that you harvest from your plants. Also, with a greenhouse you do not have to wait off a season to cultivate something which you like. It can be quite frustrating if you are excited to plant a crop, only to find out that the current season cannot sustain it due to the existing temperature conditions. With that you are left with no choice but to wait for the right time, until your excitement just wears off. However, with a greenhouse you do not have to wait off a season to cultivate something which you like. Seasonal plants can be grown anytime as you get to control the garden’s existing conditions. Allows you to grow plants in any weather – One of the potential threats that one has to regularly deal with in gardening is the constant change in weather. In times of bad weather, it is harder to keep up with maintaining your plants, however when gardening inside a greenhouse, your plants are protected from harsh outdoor elements. Everything is covered, so in the event of a heavy rain, plants are kept dry. During the snow, plants will not succumb to frost, while during hot summers, they do not get exposed to excessive heat and sunlight. Protects crops from pests and small animals – Moles,squirrels, rabbits and rodents all pose a potential harm to growing plants as they usually damage the produce. Since the greenhouse keeps everything contained within an enclosed area, even larger animals like deers can be easily kept out. Keeps the beneficial insects inside – Not all insects are harmful to plants. Ladybugs, for example, are a beneficial group of insects which are capable of consuming aphids, mealybugs, scale, leaf hoppers and mites that destroy plants. Unlike in an open area where beneficial insects may leave, a greenhouse keeps them contained in an enclosed space. Therefore, the population of pesky insects are also controlled and prevented from spreading. 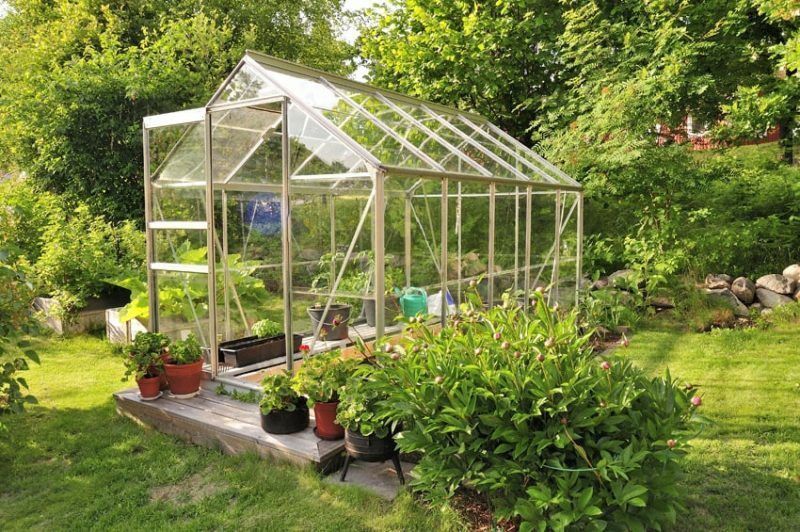 Perfect for growing a wide variety of plants – A greenhouse can hold a wide variety of plants and you can arrange it in such a way that you can take advantage of every inch of space available for gardening. You can incorporate vertical wall gardens inside or multi level or tiered planting systems. 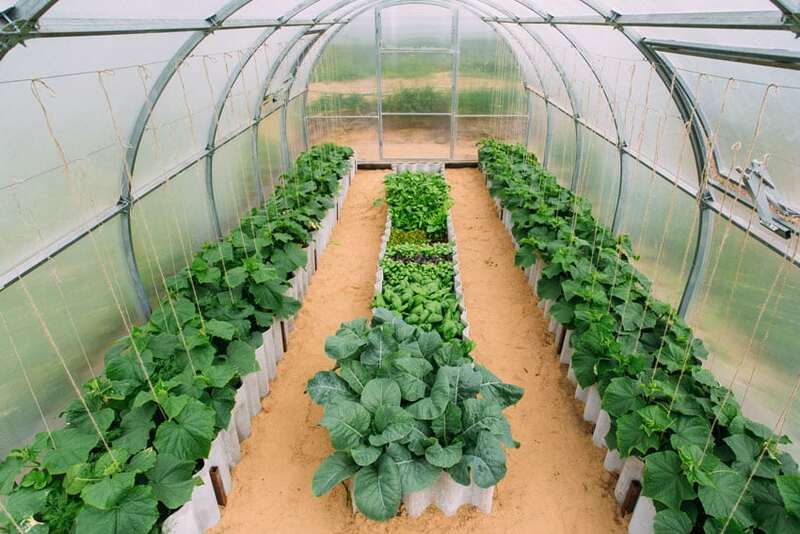 A greenhouse also allows you to experiment on growing plants which are not local to an area as the environment’s conditions can be modified according to the plant’s needs. Creates an environment which optimizes the growth potential of plants – With a greenhouse, you can easily customize the growing environment of your plants to enhance their health and promote their growth. It allows you to incorporate irrigation and drainage systems which keep the plants adequately watered. Self watering features, on the other hand, lessens the effort in maintenance and upkeep. As plants love humid and warm environments, a greenhouse also offers effective temperature control by trapping the sun’s radiation within the enclosure, thus retaining the heat within the structure. Also, with a greenhouse, there is no need for dangerous and harmful pesticide. Provides relaxation – Gardening, in general, is considered to be therapeutic and stress relieving. Some people find comfort in this activity as it is a great way to deviate from the everyday stresses of life. 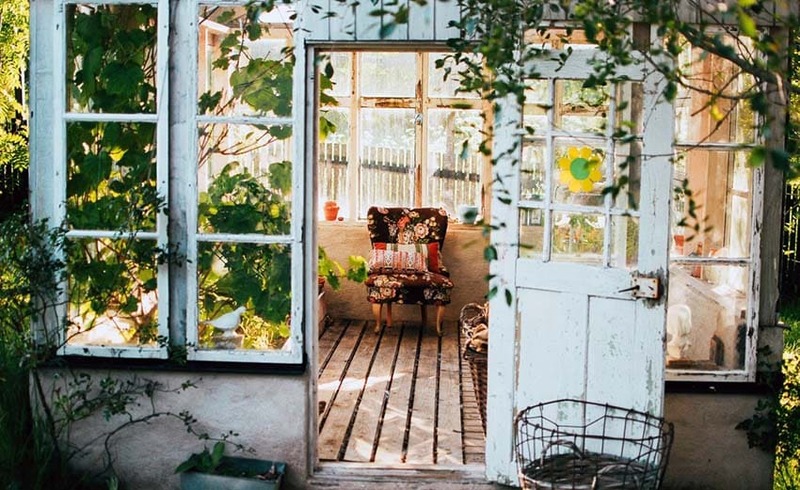 A greenhouse provides a place where you can unwind after a long tiring day from work, allowing you to enjoy the benefits of gardening all year long. Versatility and easy customization – A greenhouse can be modified in many ways according to your taste and preference and your plant’s needs. Depending on their requirements, you can decide on what type of greenhouse will work well with the type of plants you grow, whether they may be vegetables, herbs, flowering plants or ornamental foliage. Indoor and outdoor plants can be mixed. Also, you can freely choose the design elements such as the size, shape, number of doors, placement and arrangement of plants. A greenhouse can also serve as a multipurpose area for storage and for relaxation. Keeps your garden contained in one place – Keeping all the plants in one place lessens the effort required to maintain, water and feed them. An effective work flow is also ensured if the plants and gardening tools can be found in one location as you can easily access them while going through your gardening activities. Saves energy – Compared to a traditional gardening environment, a greenhouse allows you to conserve energy sources. Water can be easily controlled and made sure that nothing goes to waste. 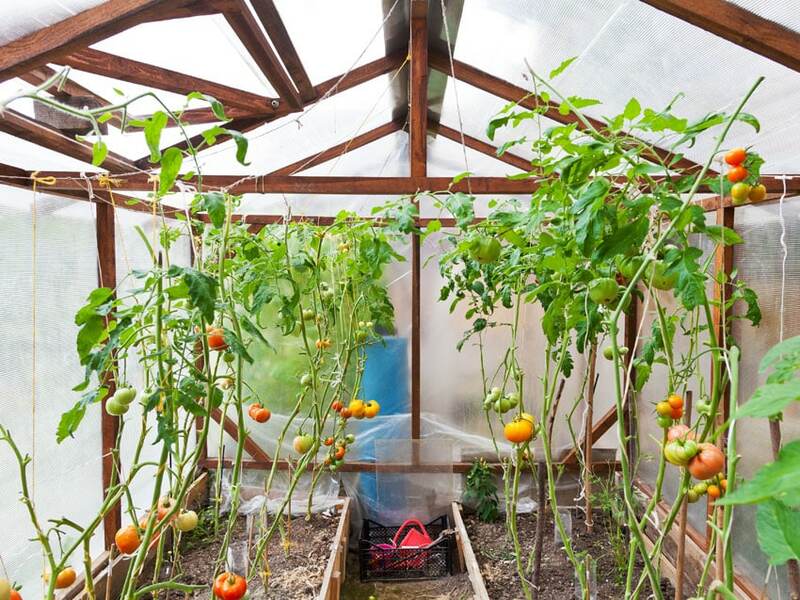 Saves money and cuts grocery expenses– A greenhouse provides an effective way to grow your own food all year round. Providing a consistent supply of fruits, vegetables and herbs, it lessens the effort required to going to the supermarket. Aside from the assurance that you get only the best quality of crops which are organic and safe, you also get to enjoy the advantage of saving money on food bills. Helps the environment – A greenhouse is an environment friendly solution that is beneficial to both the gardeners, the plants and the earth. If you want to go green and help fight global warming, the addition of a greenhouse can aid in providing a cleaner atmosphere by acting as a natural air purifier. 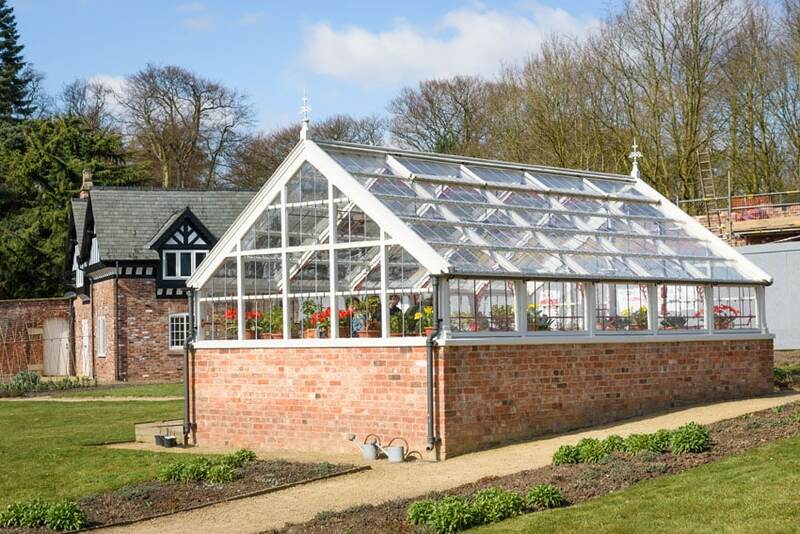 This wooden post and rafter greenhouse not only acts as a protection for the plants, but it also acts as a covered seating area for four – ideal for spending afternoon teas or for enjoying time with friends and family. Its classic white color stands out against the surrounding myriad of colorful plants and blooming flowers. 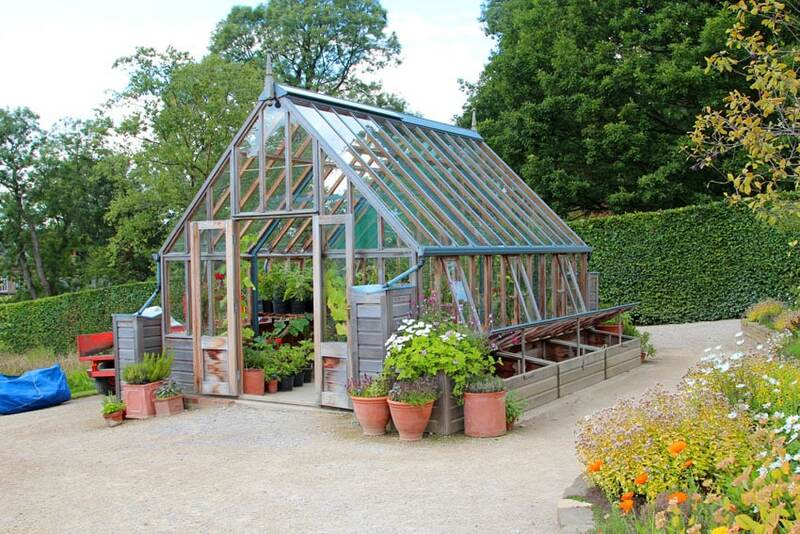 This greenhouse also acts as a charming decorative feature for the garden. The average cost of greenhouses is $25 per square foot. While the total cost for greenhouses run $13,000 with professional installation and including all the factors. Self installed or DIY greenhouses are cheaper and can drop the costs to $3500. • Size – The size of your greenhouse affects the total cost of construction because obviously, a larger greenhouse would require more materials. Large greenhouses would also entail more time and effort to build, thus resulting to increased labor costs. There are three types of greenhouses according to size. Basic Greenhouse – A basic greenhouse has a typical size of 6 feet x 8 feet and are usually hoop shaped or an arched shape. Commonly sold in packages, a basic greenhouse kit includes all the parts and materials needed for installation. On the average, basic or beginner greenhouses cost $240 per package. Medium sized Greenhouses– Medium sized greenhouses are ideal for experienced growers. With a typical size of 12 feet x 12 feet, medium sized greenhouses usually include added features such as drainage and irrigation systems. This type of greenhouses also cost more in terms of grading the foundation, laying down the floor, installing the plumbing and electrical systems. It is also usually made up of polycarbonate roofing with a vented roofing design. Unlike basic greenhouses, a medium sized greenhouse for experienced growers are not suitable to be undertaken as a “do it yourself” project, but rather require the expertise and services of a skilled professional. This type of greenhouses usually cost $3500 to $7000. • Materials – The type of materials also cause a significant impact on the cost of greenhouses. If you want to build a basic freestanding greenhouse, the most cost effective material you can use are polycarbonate panels with an aluminum frame. Alternatively, you can also build your own greenhouse using readily available materials from local home improvement stores. The cheapest greenhouse can be built using PVC pipes and sheet plastic. Although relatively cheap and costing only as much as $40, this type of greenhouses are temporary and are not meant to be used year round. For greenhouse kits with a basic steel tubing frame, the average price is $200 per set while high end kits with galvanized steel framing can cost as much as $10,000. Wooden greenhouse kits can range from $120 to $5,000, depending on the complexity of the design. Mixed materials can be utilized to create greenhouses which are more durable and sturdy. This backyard greenhouse makes use of bricks for the base of the structure, wood for the rafters and framing systems, and glass for the covering. This design is perfect for traditional houses and is the perfect complement to a brick house. Greenhouses can be bought in unassembled kits which contain all the materials that are needed to complete to project. Unlike building from scratch, greenhouse kits include ready made parts. They are usually consisted of a frame, covering and a flooring material. The main advantage of a greenhouse kit is that it saves you time, money and effort. Backyard greenhouse kits are made with several material options for the frame and the covering. The least expensive greenhouse kit is made up of PVC pipes, assembled as a hoop house, while the most expensive one is the composite greenhouse kit. Some other backyard greenhouse kits come in aluminum, wood, resin, PVC, glazing and poly carbonate. Greenhouse starter kits can be bought for as low as $10 per set. While the larger backyard greenhouse kits usually cost $200 to $5000, depending on the size and material. For those who want to save on costs but still want to enjoy the perks of a greenhouse, most local home improvement stores offer greenhouse kits which are very affordable and easy to install. 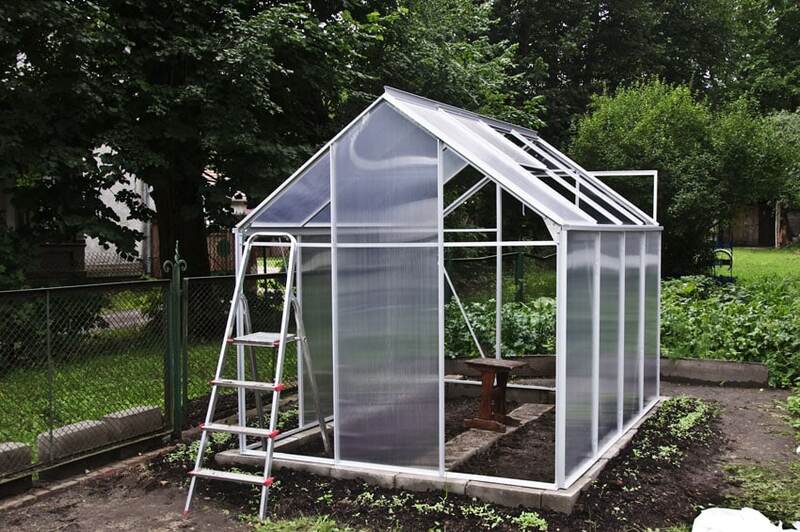 This basic backyard greenhouse makes use of pre-cut metal frames and a plastic sheet cover. The main advantage of this type of greenhouse is that it can be assembled and disassembled easily and can be relocated quickly depending on one’s preference. Made from twin wall poly carbonate panels and a painted aluminum frame, this small greenhouse can be easily set up in any backyard within our to five hours. This greenhouse kit contains all the needed parts such as a roof vent, a steel base, rain gutter, frame and covering. It allows for an effective heat retention, diffusion and ventilation. In addition to that it is also weather resistant and its aluminum frame is corrosion resistant. 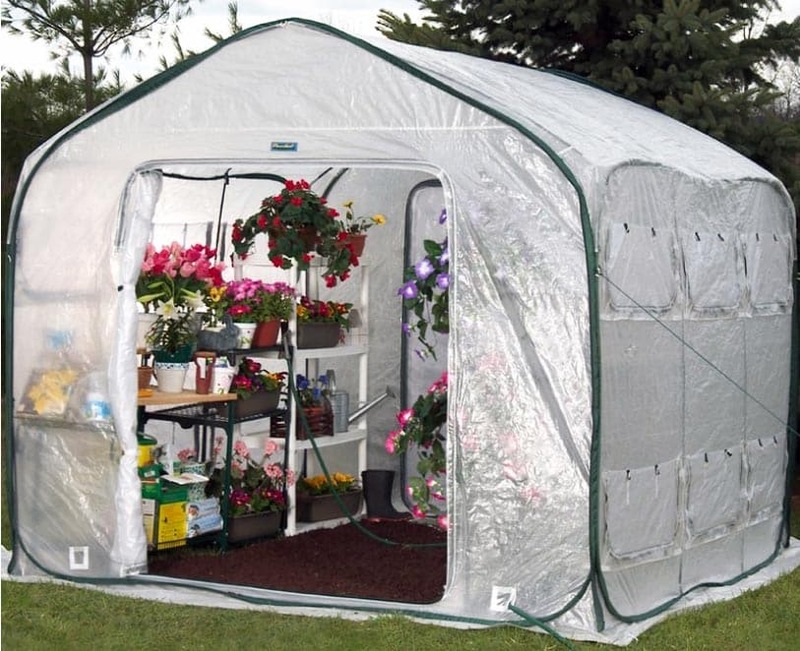 This walk in tunnel backyard greenhouse is another form of easy to assemble kit. Its structure resembles that of a tent, which starts with a simple frame and a ready made cover. 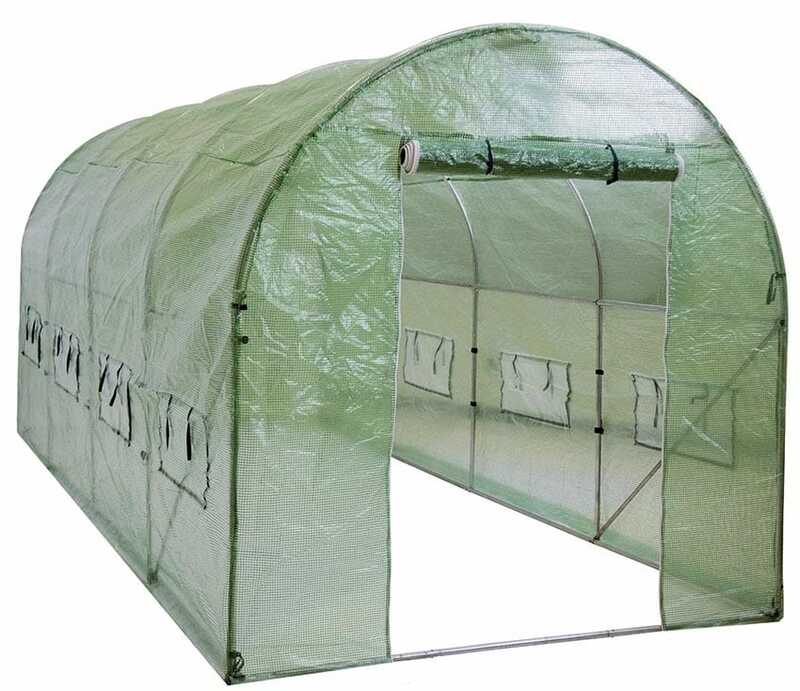 made up with heavy duty polyethylene fabric and a high grade powder coated steel tube frame, this portable greenhouse also comes with a zippered door which allows for easy access. The unique thing about this backyard greenhouse kit is that it can be attached to another piece by zipping the greenhouses together. with that, you get a more expansive protected area for growing your plants. Aside from that, it can also function as a storage shed for garden tools and other equipment you have in your backyard. made with “Gro-Tec ” material, this backyard greenhouse kit is weather resistant, durable, UV resistant and works well in improving the climate within different regions. It is ideal for growing vegetables, flowers and ornamental plants. Small greenhouse kits are the perfect head start for those who want to try greenhouse gardening. Small greenhouse kits usually come in simple designs and plans which can be built easily as a DIY project, without having taking much time and effort to install. 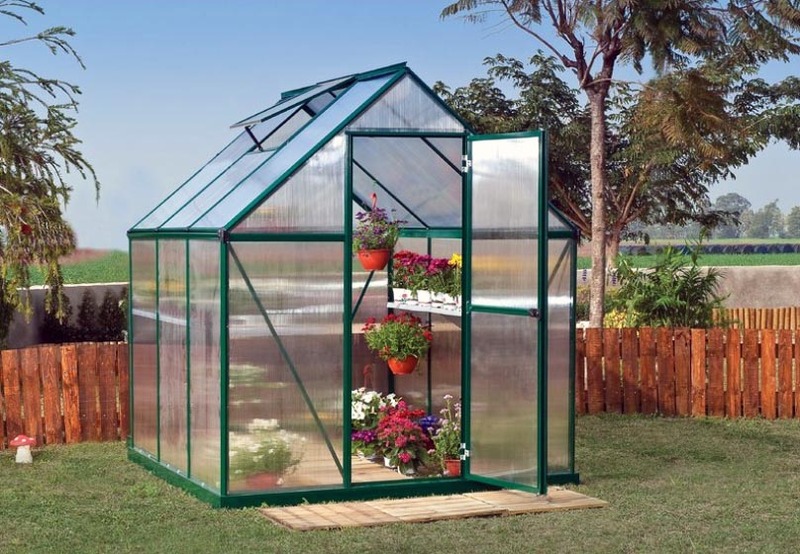 This type of greenhouse is easy to assemble and disassemble for storage and can be moved to another area if needed. This ready made mini greenhouse has a tunnel like form which is made up of thin metal tubes and a plastic sheet covering. The zippered opening allows for easy access in terms of plant care and maintenance. although small, it works well in keeping vegetables and other crops well protected from the rain, excessive heat and harmful animals. This ready made walk in greenhouse effectively makes use of small and limited spaces by providing builtin metal racks and shelves for holding potted plants. It is made up of sturdy powder coated metal frame which doe not easily rust and corrode, while the covering is made with a durable clear plastic sheet. Aside from that, it is easy to assemble and can be placed not only in backyards or gardens, but also in patios, decks and balconies. A greenhouse does not always need to be a big structure which can accommodate persons in it. It can be a simple freestanding shelving unit with an effective covering material. As long as it keeps your plants protected from the weather, then it can be classified as a greenhouse. 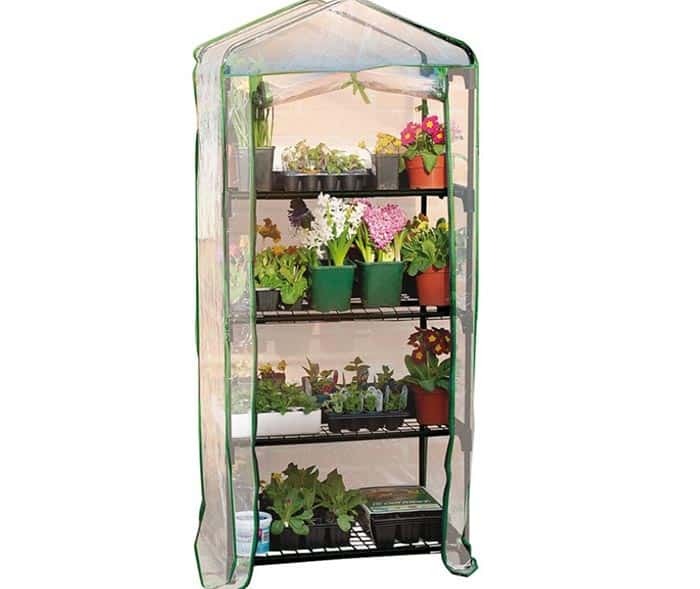 This 4 tier mini greenhouse is made up of a tubular steel frame and a durable clear polyethylene cover. Ths type of greenhouse is perfect for houses where space is at a premium, like condominium units, apartments and studios. Protect growing trees from the harsh weather using single plant cold frames. Unlike regular greenhouses which can commonly accommodate a large variety of plants, this ready made greenhouse is specifically designed for protecting small trees, shrubs and bushes from harsh outdoor elements. 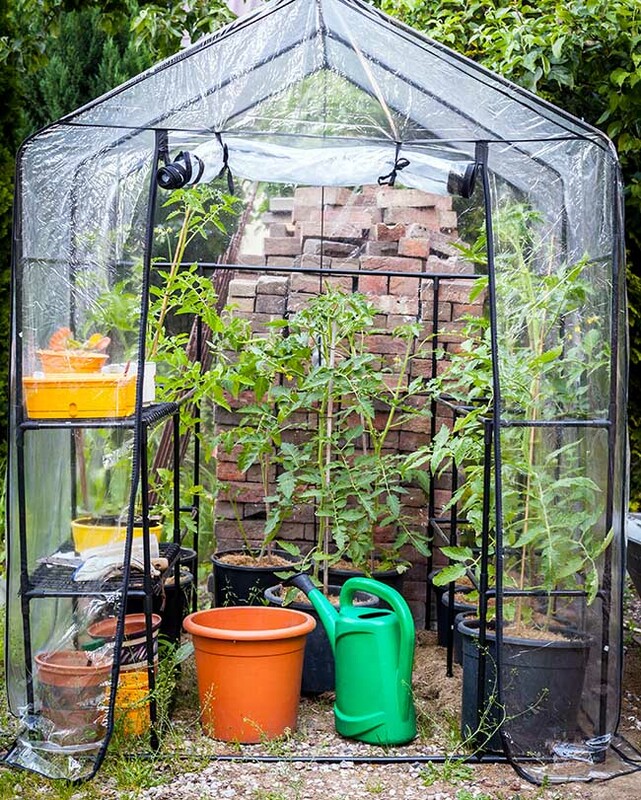 This portable greenhouse is made up of a polyethylene film cover over a steel frame and can be easily assembled through “pop up”. It is perfect for caging small fruit bearing plants and trees. There are several options for greenhouse designs, each using different materials and possessing specific positive and negative features. Greenhouses can be bought in kits which are ready for assemble or prefabricated pieces which are ready to set on a foundation. It can be customized, built from scratch, “do it yourself” or installed by a professional. Before building your very own greenhouse, it is important to know some basics regarding their design, materials and construction. Read on as we explore some backyard greenhouse ideas to help you decide which one is the best for your home. This large post and rafter greenhouse is made up of a tubular steel framing system, glazing and a brick base. On top of the greenhouse are openings which allow for ventilation and proper air circulation. On the roofing are mats which provide shade to plants which need less exposure to the sun. The simplest and most common greenhouse structure type, this is composed of embedded post and rafters. This design is also considered to be strongest as the rafter lend support and reinforce the strength of the roof. This type of greenhouse gives an optimum and maximum use of space. 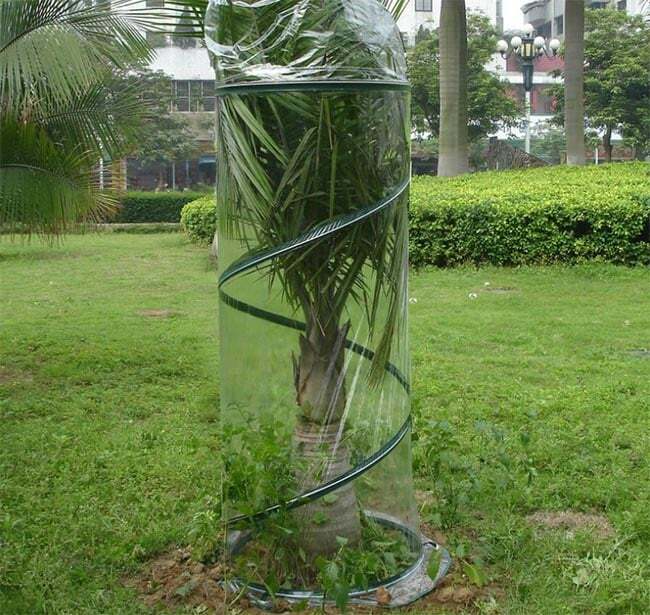 It also provides adequate air circulation for the plants. Compared to other greenhouse structure designs, a post and rafter greenhouse needs more materials. Post and rafter greenhouses are considered to be heavy at the top, thus requiring posts and frames that are footed. It can be covered with glass and poly carbonate rigid panels. Plant beds can be built inside greenhouses to designate specific areas for each type of crop. 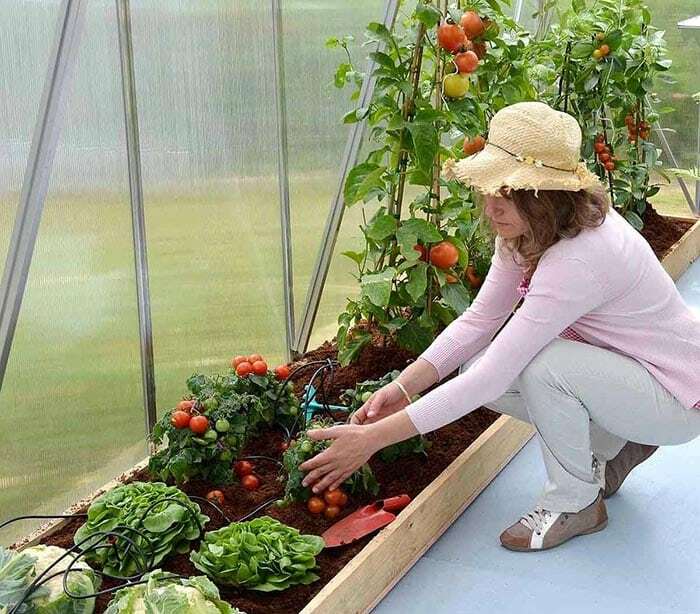 Aside from that, using separate plant beds will also enable you to meet each of the plant’s specific needs and soil requirements.This post and rafter greenhouse makes use of a wooden frame with a plastic covering simple while the inside is filled with plant beds which are constructed from natural wood boards. A – frame greenhouses are characterized by a side walls and a roof that form a simple triangular structure. 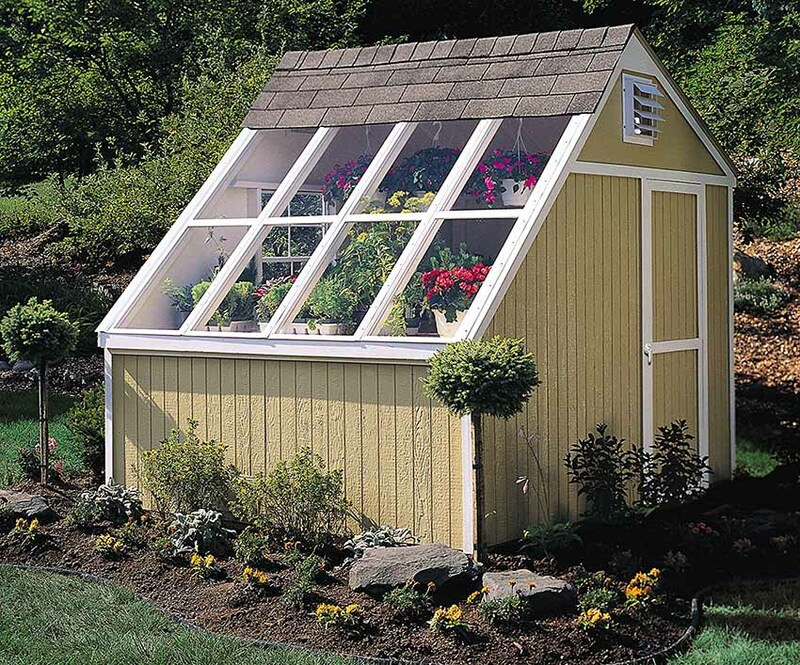 This greenhouse design is popular because of its simple and straightforward design. Compared to a post and rafter greenhouse, A frame greenhouses are easier to construct and requires less materials to build. Typical coverings for A frame greenhouses are polycarbonate panels and glass. The only drawback of using an A frame greenhouse design is that the leaning side walls narrow the spaces, thus giving a limited amount of space for usage. The corners can also pose a problem when it comes to adequate air circulation. Window greenhouses, otherwise known as greenhouse windows, bay windows or window mounted greenhouses are a type of greenhouse that is usually used indoors. Compared to a regular window which uses a single glass pane, a window greenhouse projects to the exterior wall of the house. This allows for light to enter while an open design on both sides permits maximum ventilation. This type of greenhouse design is commonly used for growing herbs and other small plants because of its limited size. Window greenhouses maximize the use of windows by turning them into an indoor garden which can grow plants year round. they are often less expensive than a separate greenhouse structure. Typically, window greenhouse are covered with glass as they are attached to the home. PVC greenhouses are commonly made into a hoop house form. This type of greenhouse is the cheapest material option that one can explore. PVC greenhouses are simple and can be built into any size depending on the existing need. This type of greenhouse design can be completed in several hours and do not require the services of a professional to complete. PVC greenhouses may have a straightforward design, but when it comes to efficiency in growing plants, they can surely help in extending your growing season all year round. This type of greenhouse is also more sturdy and can stand up to the rain and heat. This compact greenhouse is the perfect solution for small gardens which cannot accommodate a standard greenhouse. Just like the majority of ready made greenhouses, this comes as a kit with a powder coated steel frame and PVC vinyl covering. The openings can be easily accessed using zippers , providing adequate ventilation and air circulation for small potted plants. Cold frames are a transparent roofed enclosure or a structural cover for a garden that is used to protect plants from the rain, snow, wind or the excessive low temperatures. It functions like a miniature greenhouse that is built close to the ground. Its appearance resembles that of a bottomless box that has a skylight which can be opened. Cold frames are also considered to the the simplest and the cheapest form of greenhouses. 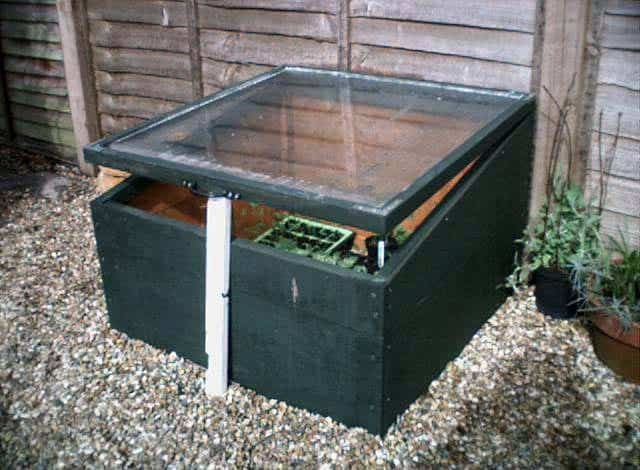 Cold frame require a type of covering that can be opened to allow warm air and heat ventilation. 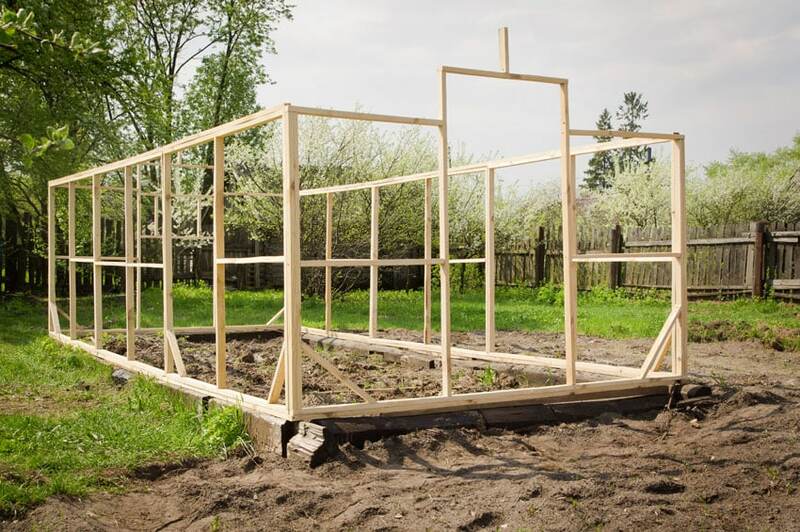 Common materials for a cold frame are wood with plastic sheeting or wood with glass. It can be undertaken as a weekend “do it yourself’ project using both old and new materials such as scrap wood, pallets and wold window. And since, it can be made with any material, its cost is manageable as it can either be cheap or practically free. One major disadvantage of using cold frames is that it can sometimes cause overheating once exposed to the sun with closed windows. Overheating can result to damaged plants. Also, depending on the type of material employed, DIY cold frames can sometimes be less durable and prone to damage. Attached to the sides of this wood and glass greenhouse are cold frames. These box like structures are made up of wooden boards with a movable door on top. They are placed on the ground to shelter and keep small plants warm without using artificial heat. If your backyard space permits, the addition of cold frames to your existing greenhouse will enable you to grow more plants all year round. 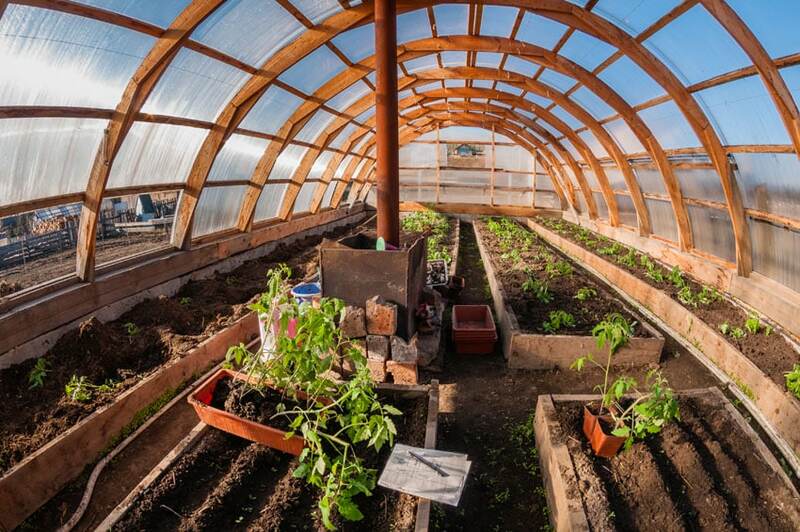 A hoop house got its name from its shape which is like a semicircular structure. 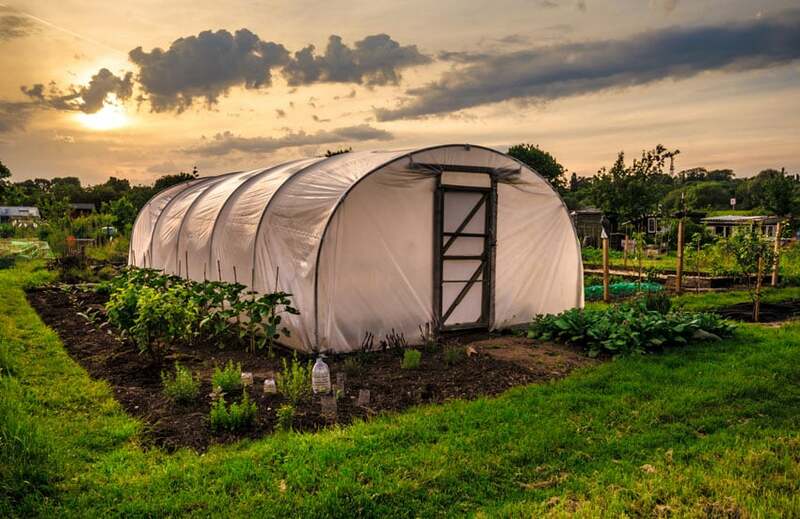 Hoop houses are typically made up of aluminum pipes or PVC plastic pipes which are bent and covered with a single layer of greenhouse fabric or polymer plastic covering. For better insulation, a second layer of fabric or plastic covering is added. The hoop or dome shaped roof allows rainwater to flow downwards and snow to shed from the exterior. One of the primary advantages of a hoop house is that it is easy to build and can be used even in limited spaces. Hoop houses are also considered to be one of the most inexpensive options for greenhouses with its average price amounting to as low as $1 per square foot. However, compared to an A frame or post and rafter greenhouse, the hoop house is less sturdy. 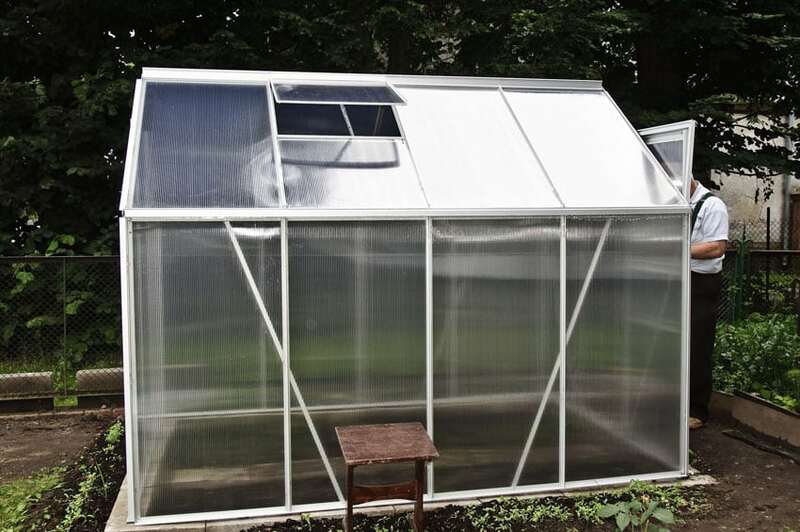 This large hoop house is made up of poly carbonate panels in wooden frames. Inside are wooden plant beds which hold tomato plants. Tomatoes and hoop houses go well together because the covering over the plants produces a controlled environment which help improve the fruit quality. 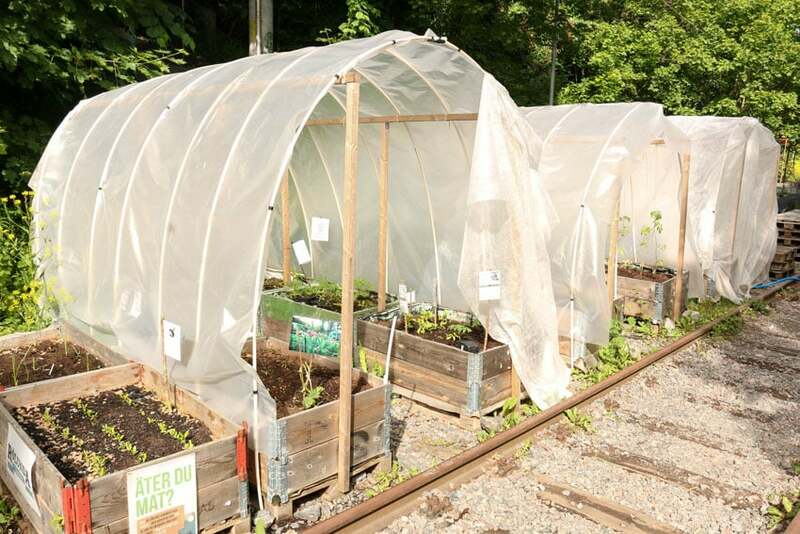 Simple hoop houses can be made using basic materials such as PVC pipes, wooden posts and a plastic covering. Not only are they affordable, but they work effectively against the sun and rain. 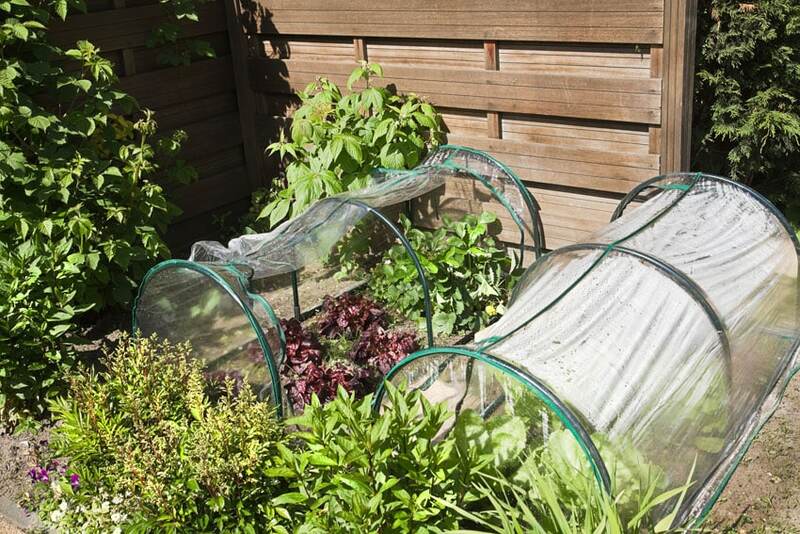 This DIY hoop houses shelter small wooden plant beds with different crops. This small domed greenhouse provides protection for pepper plants and trailing cucumbers. To separate the garden plots of each vegetable, a wooden plank border is used. 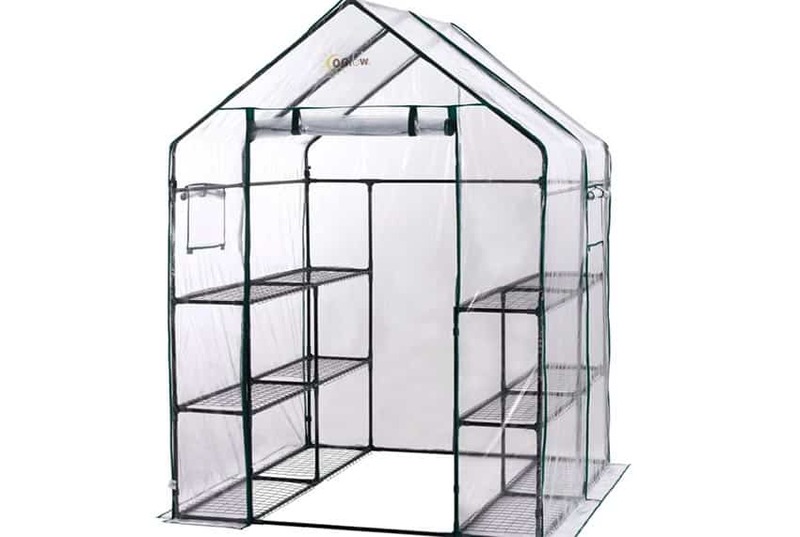 This hoop house is made with plastic covering and a steel frame and can be used to house both potted plants or plants which are directly planted into the ground. Lean to greenhouses, also known as attached greenhouses, is a type of greenhouse that is attached to an existing exterior wall of a house. This is traditionally built at the back of the home, however it can also be placed on the sides, depending on the existing site conditions and the orientation of the house. Compared to other greenhouse designs, a lean to greenhouse is less expensive since it shares a wall with the house and does not require a separate or stand alone structure. It is also closer to the water, electricity and heat source as it is considered a part of the main house. One drawback of lean to greenhouses is that since it is attached to an exterior wall of the house, temperature control can be quite challenging. Exterior walls are built to collects the sun’s heat while the greenhouse wall windows may not be able to contain the heat. This small lean to greenhouse can be easily attached to any existing exterior wall in your house. The compact size of this ready made greenhouse allows for growing a wide variety of vegetables without taking too much space. It is made with a rust resistant aluminum fame and sturdy poly carbonate panels that can withstand harsh weather. Its modern design also allows it to harmoniously blend with aesthetics of contemporary themed houses. A greenhouse shed, also known as a potting shed or a solar shed is a multipurpose structure that serves as storage for garden tools and supplies, while at the same time providing a place for potting plants. Greenhouse sheds are designed in as such a way that one side of the structure allows an adequate amount of sunlight in. Typically, it looks like any small, pitched roofed building but with one side filled with windows. Other greenhouse shed designs employ two different materials for each side – with one side covered in glazing while the other half covered with solid siding panels. One major advantage of greenhouse sheds is that it allows you to maximize any limited space by serving dual functions. However, this can also pose as a problem for some homeowners as the area can get cluttered if not maintained well. Compared to a regular greenhouse which is mainly used for growing plants, a greenhouse shed shares the space with other tools. So if you want to grow a large variety of plants, then this might not be the right option for you. But if you have a limited space within your yard and do not have the luxury to build two separate structures for your greenhouse and shed, then this might be the best design you can explore. This type of greenhouse design also present some disadvantages. The lack of light, proper ventilation and effective temperature control are some of the issues that one may encounter with greenhouse sheds. Since only a part is covered in glazing or windows, there is a low amount of light which enters the structure, compared to a regular greenhouse design. This can be quite problematic especially during the cold days of winter. Although greenhouses may look complicated and hard to build, they can be easily made at home using simple materials. Along with careful planning and proper installation, simple basic greenhouse can be accomplished in two o three days, provided that you are favored with a good weather. For this specific “how to” , we will be helping you to build your very own hoop house. A hoop house is one of the simplest greenhouse designs that can be built without the help of a professional installer. The materials are cheap and can be bought in local home improvement stores. For this specific PVC hoop house, the size is 12 feet by 24 feet, giving you a large space to hold plenty of plants within your garden. If you have a limited space in your home, you can adjust the size of the hoops and frames based on the available area in your backyard. 1.Choose a location. 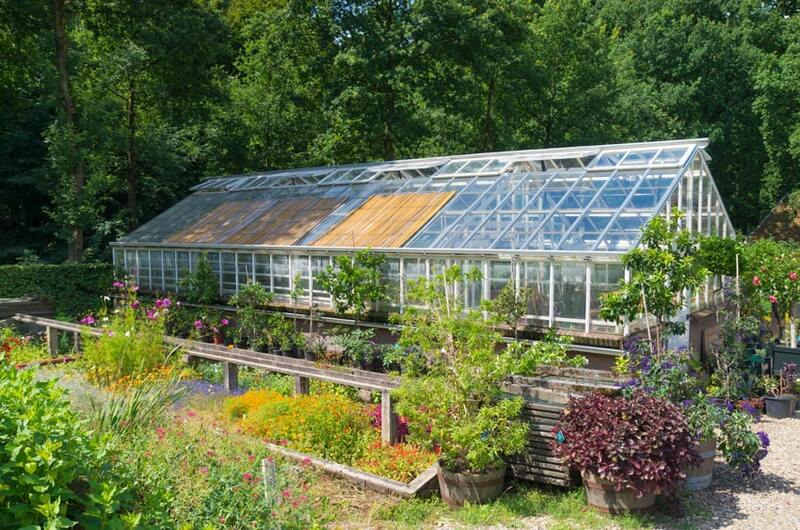 The ideal location for greenhouses is one that receives direct sunlight for at least 6 hours per day. Typically, greenhouses are built with a southern orientation and exposure. Also, the location must be leveled or at least, can be leveled. 2.Learn about the existing climate in your region. Climate is a significant factor when it comes to growing plants. Since you are creating an artificial environment for your plants to ron in all year round, it is important to know the existing environmental conditions in your area. In cold regions, you will be needing insulating materials and a heating system, while in hot regions, you will be needing shade. But generally, temperature control is needed to ensure the healthy growth of your plants. 3.Take note of ventilation, air circulation, temperature control, pest control, water supply and heating systems. 4.Make sure that there is an existing supply of electricity and water. Electricity and water are essential to make your greenhouses work. They are used for heating systems, lighting and other design features. Proximity to water and electricity supply will ensure the effectivity of your greenhouse. 5.Check if the area is well drained. Drainage is important because it prevents the soil from being too saturated and prevents diseases from spreading to your plants. If the soil is too moist, it becomes a breeding ground for algae and other pests and insects. 6.Choose the type of structure you want to build. Decide on whether you want to use a ready made greenhouse kit or if you prefer to build from scratch. This will also help you determine the budget you need to prepare for your project, the type of labor your will be requiring and the materials you will be using. 7.If using wood for your greenhouse frames, make sure to choose the right type of species.Use pressure treated wood or a type of wood species that is naturally resilient when wet. Cedar is an example of a water resistant and insect resistant wood as it contains natural oils that allow it to withstand rot, decay, molds and termites. If using pressure treated pine, leave it outside in the rain for a few weeks before building your greenhouse. 8.Determine the size of your greenhouse. Measure the area where you will be putting your greenhouse. Use wooden stakes to mark the ground with the length and the width of the greenhouse. 9.Prep the ground. If using the natural soil as the base layer, till the ground and remove any unwanted plants that are growing. A landscaping fabric may be used to create a barrier for weeds. If using one, layer the top of the fabric with soil. -Connect two pieces of of 2x6x12 wood using a 2×4 wood, to create a single length of 24 feet. Make two of these, one for both sides. -Using the boards, form a rectangle in your preferred greenhouse site. The sizes of the sides must be 24 feet long while the top and bottom members are 12 inches wide (using the 2x6x12 lumbers). -Check if the boards are perfectly aligned with each other. Start by putting the right side to the top frame, then put the left side and finish off with the bottom board. The top and bottom boards must be inside the long sides (left and right boards) . You may use temporary wood stakes on the outside of the frame to make sure that the base is perfectly squared. -Join each board using 3 inch screws. -Double check the alignment and adjust if needed. -Clamp the bars together and cut them into 24 inches or 2 feet long pieces using a reciprocating saw with a metal cutting blade. – Using a hammer, pound the rebars at least ⅛” away from the side of the bottom boards. Make sure that they are placed at 2 feet intervals. The gap is needed so that there is room for the hoop to slide on. -Build a door that is 3 feet wide by 8 feet tall using the 2x4x8 lumber pieces. Use one as the header, two for the sides and leave the bottom open. -Find the location of your door in the bottom boards of your rectangular frame. Mark using a pencil. This will also be the location of the ties for the door frame studs. -Plant the door firmly into the post holes. -Attach the studs to the bottom boards of your rectangular frame using an electric drill and galvanized screws. -Mix concrete according to instructions. -Pour concrete into the post holes and let it cure for 24 to 48 hours. The ridge or the center posts are recommended to reinforce the strength and durability of your greenhouse against strong winds. This will also make the plastic covering last longer. -Dig post holes 8 feet deep. measure from where the edges of the door are. -Locate the position of the center ridges. It has to be 8 foot away from the door and 6 feet away from the sides. Attach framing brackets for the center ridges, one on each door frame, two on each post. -Place the 4x4x8 lumbers into the post holes. -Prepare the concrete according to the instructions. Pour over the post holes and allow to cure for 24 to 48 hours. -Add the topsoil (ask your supplier to estimate the amount needed), then on top of it, add some peat moss, compost and potting soil. Combine this mixture evenly. -Place a piece of PVC pipe over a rebar and plant it at least an inch deep into the soil. Pull the other end over the ridges and plant it over the rebar located at the other side. Make sure that the hoops are firmly planted onto the ground. -Repeat the same process for all 13 pieces of hoops. -Secure the hoops to the center ridges using metal straps. -Check the alignment of the hoops, adjust if needed. -Tighten the screws of the straps to make sure that the hoops do not move. -Fasten the top of the hoop and the metal straps together with duct tape to reinforce strength. -Cut four small wood blocks and attach them to the bottom border of the frame (near the door). Fasten it near the corner, just beside the first rebar hoop and make sure that they are tightly fit together. -Do the same step for the other end of the bottom border. -Fasten the hoop going over the end wall and the top of the door frame using straps and screws. Laying the greenhouse covering requires an additional help and do it on a warm day to allow the plastic to stretch.Prior to installation, roll it over a flat surface and allow it to stretch under the sun. -Lay the plastic sheet or film over the greenhouse and secure one side to the bottom frame using lathe strips. -Stretch the plastic film and secure the other side tightly to the bottom frame using lathe strips. -Do the same thing for the door header and the wall sidings beside the door, just make sure to exclude the door opening. Secure with lathe strips. -Make sure that the plastic sheet is tightly placed to avoid sagging in the future. -Once tightly in place, you can now permanently fasten the plastic sheet to the studs and the bottom frame using galvanized nails. -Attach the shade cloth or landscaping felt inside the structure. Fasten them to the hoops using zip ties. The shade cloth will help control the heat and temperature inside the hoop house. -Assemble a simple yet sturdy four braces door using lumber. -Attach the door and check if it swings properly. Check for alignment. 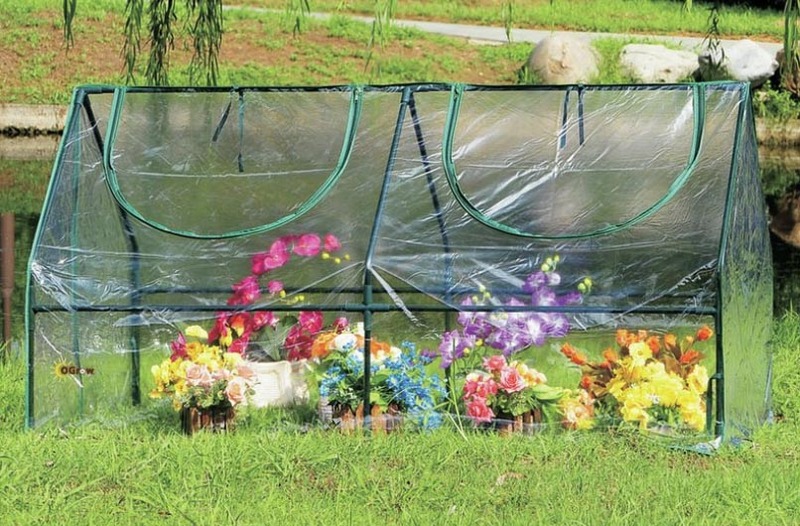 -Cover the door frame with the same plastic sheet used as the greenhouse cover. Attach with lathe strips and secure tightly with nails. -Add a simple lock, latch or handle, depending on your preference. -Start planting your crops according to their specific requirement. This is another type of greenhouse structure which can be made easily at home. Post and rafter greenhouses require a frame which is made up of wood cut into different sizes. The wood is fastened together with galvanized screws and nails. The base material can be made using large wood blocks that are planted onto the ground. After the assembly of the wooden frame, the covering is fixed. Plastic sheeting is rolled onto the sides, the roof and the end walls and tight stretched to ensure that it does not sag over time. The plastic covering is securely fastened into place using nails. 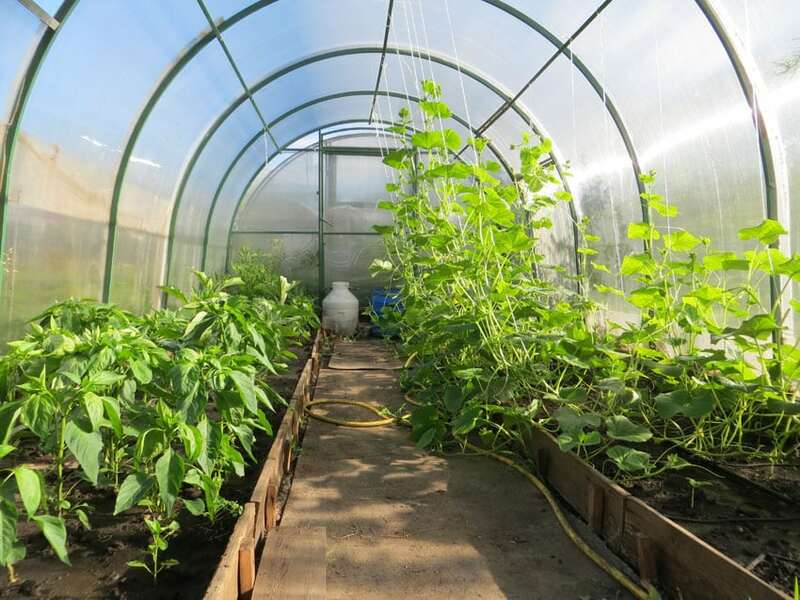 There are wide variety of materials which once can use to build a greenhouse. Generally, a greenhouse has two main parts : the frame and the covering. The covering is consisted of the roofing and siding of the greenhouse. Wood Greenhouse Frames – Wood is a popular material for greenhouse framing because it is widely available in the market. Its abundant supply, easy assembly and highly customizable feature makes it the ideal material for DIY greenhouse projects. It is also well loved because of the distinct natural beauty it possesses. This material also works well with insulation, however, some homeowners find this impractical to use because wood is naturally prone to warping and rotting. Greenhouses, being constantly exposed to moisture and dampness, require a material that is resilient even when wet and unless you are using a pressure treated wood or a species that is inherently water resistant, then your greenhouse frame can easily get damages. If using wood for greenhouses, make sure to go with cedar or redwood as these are the proven species that can withstand outdoor use. Although they cost more, these types of wood contain natural oils which make them inherently resistant to insect, rot, molds and mildew. Alternatively, pressure treated pine can also be used, just make sure that they are properly sealed. Galvanized Steel Greenhouse Frames – galvanized steel is a type of metal that is made up of steel or iron, covered with a zinc coating to prevent rusting. It is one of the most affordable and practical materials for a greenhouse roofing. Because of its high durability, a galvanized steel greenhouse needs less framing members. Lesser framing means lesser shadows projected into the greenhouse, thus ensuring a more well lighted space. Consequently, this also results to fewer materials needed to build and lesser costs. Typically, galvanized steel greenhouse framing are used with polyethylene film. However, one of its major drawback is that the zinc eventually wears off and will also rust after some time. Aluminum Greenhouse Frames – Aluminum is a type of metal that is known for its durability. Aluminum is low maintenance and unlike other metals, it does not rust or get easily damaged when exposed to harsh elements. It can hold up to harsh outdoor elements like rain and sun exposure, but has the possibility to break down in the event of extreme weather conditions such as high winds and heavy snowfall. However, when it comes to strength, it needs to be reinforced, doubled or increased in size as it cannot hold too much weight. Aluminum works best with a glass or poly carbonate siding as it gives it a rigid form. It can either be painted, anodized or powder coated to achieve the particular look you desire for your greenhouse. Alternatively, more heavy duty type of metal like steel can also work as a greenhouse frame material, but this is more expensive and the weight can be an issue because it is heavy to lift and harder to handle than aluminum. The downside of using aluminum for your greenhouse frame is that it has poor insulation properties. Unlike PVC, aluminum cannot maintain heat well, thus allowing it to escape from your greenhouse. PVC or Polyvinyl chloride Greenhouse Frames – PVC is a type of lightweight material that is affordable and easy to assemble. Although not as resilient as metal and mood, PVC can withstand exposure to elements like insects, molds, mildews and they do not rot, decay or warp. The advantage of using PVC for greenhouse framing is that it limits heat loss thus keeping the temperature controlled and your greenhouse well insulated. In addition to that, they usually have a lifespan of 20 years. PVC greenhouse frames are also suitable for large greenhouses. It is also commonly used for hoop houses as it is flexible and easy to work with. One of its forms, the PVC pipe is usually used for DIY greenhouses as this materials does not require the skills of a professional when it comes to installation. Compared to wood and metal, PVC greenhouse frames are also cheaper. However, one of the biggest drawbacks of using PVC plastic greenhouse frames is that they deteriorate under the sunlight. This problem can be addressed by using UV protection to ensure that your greenhouse lasts long. It can also lack in strength and will not be able to stand up to heavy rains and strong winds. Plastic Greenhouse Frames – An alternative to traditional materials like wood and metal, plastic is another popular choice for greenhouse frames. Just like PVC, plastic is durable, but when it comes to continuous exposure to the sun, it has the tendency to warp, expand and contract. Although this will take several years to create an impact on your greenhouse, address the issue beforehand by applying a light colored resin base to prevent warping and extend the lifespan of your greenhouse. Glass Greenhouse Covering – Glass is the most traditional covering material used for greenhouses. 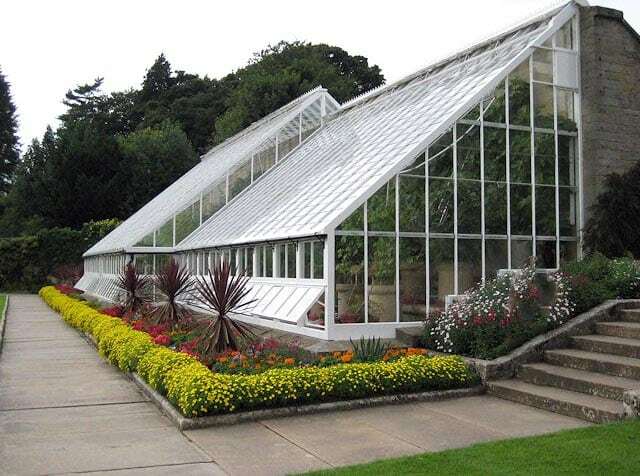 Old greenhouses were commonly made up of hundreds of glass panels with metal or wooden frames. This material allows for good transmission of sunlight, keeping your plants adequately lighted. However, one of the advantages of using glass for greenhouse coverings is that they are not good insulators. Aside from that, upkeep is also a potential issue as glass is difficult to replace once broken. Its cost is also one potential drawback as it is more expensive compared to other covering materials. The price of annealed and tempered glass for greenhouses usually range $6 to $8,50 per square foot with a thickness of 3/16 inch to ¼ inch. When using glass as a greenhouse covering, a sturdy structural system is needed to support the weight of the roof and the sidings. With proper construction and maintenance, a glass greenhouse can last for a minimum of 30 years. Fiberglass Greenhouse Covering – Fiberglass is almost similar to glass when it comes to letting the sunlight into your greenhouse, but it terms of durability, it does not break easily. A greenhouse covering that is made up of fiberglass allows more light when the sun is located at lower angles because less light is reflected. Fiberglass usually comes in transparent or clear and translucent forms. Typically, it comes with a 10 years warrant from suppliers. Overtime, fiberglass panels discolor into a yellowish form and sometimes structurally fail by deteriorating on the top and exposing the fibers into the surface. The exposed fibers usually cause dirt to get trapped and requires to be rewashed and resealed to prevent them from blocking the sunlight from entering the greenhouse. On the average, fiberglass greenhouse covering cost $72 per 4×8 foot rigid corrugated panel, while flexible fiberglass rolls usually cost $335 per 4×50 foot roll. Vinyl Greenhouse Covering – Vinyl is usually used as coverings for greenhouses with a clear and exposed look. They work perfectly well if you want to give your guests a glimpse of what’s inside the greenhouse without having to enter the structure. Unlike other materials, vinyl is only advisable to be used on the ends of the greenhouse and not for the roof. Clear vinyl greenhouse sidings typically have a 4 year lifespan and usually cost $130 for a 16 millimeter thick 54 inch by 50 feet roll. Acrylic Greenhouse Covering – Acrylic or “plexi glass” is made up of polymers of acrylic. It is commonly found in skylights and is used in other architectural and building applications. Acrylic also works as a material for greenhouse covering since they are strong and can withstand the exposure to snow and can stand up to the impact of strong winds and hail storms. Typically, acrylic greenhouses can last for 20 years and are effective materials for greenhouses since they can reduce the heating costs for up to 30%. Installation wise, they require a specific type of attachment so that they do not expand and contract once exposed to outdoor elements. Compared to other materials, acrylic is expensive but proves to be a wise investment in the long run. Single layer acrylic panels typically cost $90 per panel, while double acrylic panels cost more at $108 per sheet for a size of 8 millimeter thick, 41 inches x 8 foot sheet. The difference between the two is that, twin acrylic panels have an airspace in between which allows for insulation. Other types of acrylic panels which can be used as greenhouse coverings are triple acrylic panels, quad acrylic panels, non drip acrylic panels and UV blocking acrylic panels. Poly carbonate Greenhouse Covering – Poly carbonate is a type of synthetic material that is made up of thermoplastic polymers. Just like plastic, this material is lightweight yet considered to be strong and durable. Polycarbonate sheets usually undergo a UV treatment to make them more resilient for outdoor use.This ensure that the material does not discolor into a yellowish hue and will not deteriorate even when exposed to excessive sun. UV treated polycarbonate coverings are guaranteed to last for 10 years. Poly carbonate usually comes in two forms, namely sheets and rolls with thicknesses that vary from 0.03 inch to ½ inch. The average cost of poly carbonate rigid panels cost $51 for a 6 millimeter thick 4 feet by 8 feet panel. Corrugated poly carbonate panel is $4.70 per linear foot for a single wall construction. Poly carbonate rolls or flexible sheeting usually have a price of $6 per linear foot. Polyethylene Plastic Greenhouse Covering – Polyethylene is the least expensive covering for a greenhouse. It comes in two forms namely : polyethylene plastic films and polyethylene plastic panels. This type of material is guaranteed to last for 10 years. Polyethylene greenhouse panels usually have a twin wall construction. The air space in between allows for improved insulation. The average price of polyethylene panels are $6 per foot for 3 millimeter thick flexible rolls. To allow the vines of the tomato plant to grow freely, the leaves and branches are suspended on this small greenhouse roof rafters. 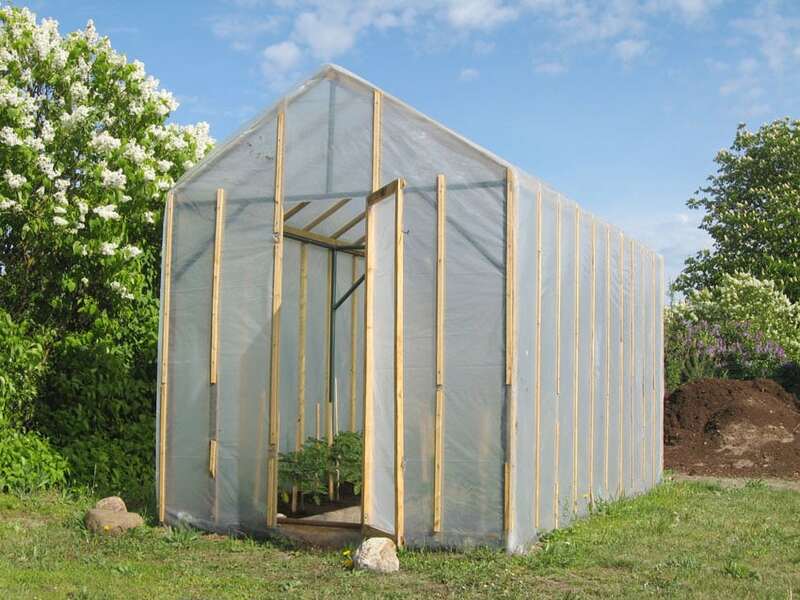 To provide protection and to cultivate fruit bearing plants such as the one shown above, you can make a small greenhouse using cheap wooden frames and a plastic sheet covering. Keeping an opening on the roof will allow adequate air and natural light to pass through, without the need for artificial sources. Greenhouse panels are used to cover the perimeter and the proofing of greenhouses. This is commonly used for permanent structures. The most common type of greenhouse panel is the poly carbonate panel. Poly carbonate is a type of rigid panel that is made up of plastic that is almost as transparent as glass. Poly carbonate greenhouse panels are available in single layer or double wall thicknesses. It is easy to install and can be cut into different sizes. Greenhouse panels usually have air pockets between the walls which act as an insulation system. And since this material is transparent, light transmission is also efficient. Greenhouse panels usually come in thicknesses which range from 4 millimeters, 6 millimeters and 8 millimeters. The standard sheet size for greenhouse panels are 4 feet by 8 feet. 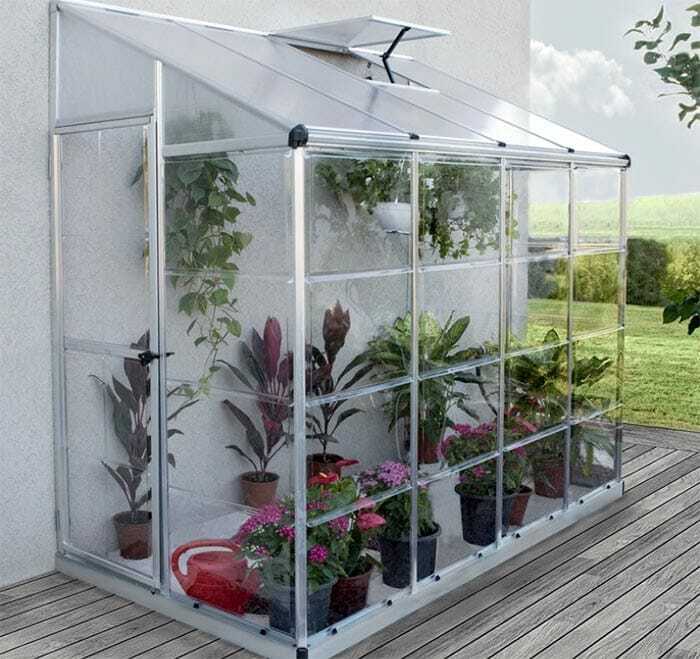 This small greenhouse is made up of an aluminum metal frame and translucent poly carbonate panels. Poly carbonate panels may appear thin and lightweight, but they are sturdy enough to provide protection against the sun, rain and snow. Once reinforced with a metal frame, it becomes stronger. Poly carbonate panels are also ideal covering for greenhouses because the allow for easy customization. This greenhouse has a sleek and compact design which can be used for small backyards and garden spaces. Poycarbonate panels are also suitable for DIY greenhouses as they are easy to manipulate and install. Greenhouse fabrics are used to cover the roof, sidings and frames of a greenhouse. Unlike greenhouse panels, greenhouse fabrics do not last as long and are ideal to be used for temporary or semi permanent structures. A specialized type of fabric, known as the greenhouse shade cloth, is made up of knitted polyethylene fabric. This type of fabric is not susceptible to mold, mildews and rotting and will not become brittle over time. This shade fabric helps protect plants from direct sunlight while offering maximum ventilation and effective insulation. Another advantage of using greenhouse shade cloths is that they diffuse the sunlight better and reflects heat well, keeping the greenhouse temperature cooler. This type of fabric is also easy to install and usually comes in a prefabricated form to lessen the amount of time and effort for installation. This DIY greenhouse offers a very basic look, using simple construction materials like plastic and thin wood frame. The wooden frame is reinforced with tubular steel to make the structure ore durable and stronger. Simple greenhouse structures like the one shown above are quick and easy fixes to extending your plant’s growing season. One of the significant components of a greenhouse is the lighting. Lights are essential for the food making process, otherwise known as photosynthesis. When plants re exposed to adequate light, they grow more healthily and produce food sufficiently. One way to introduce lights into a greenhouse environment is through the use of “grow lights”. Grow lights are primarily used for cultivating plants, in the absence of adequate sunlight. There are different types of grow lights and each one varies depending on the need of your plant. By nature, plants respond differently to each light color. Blue and red lights give out the most impact for photosynthesis. Blue light or cool light, is ideal if you want to promote a compact and bushy growth. Red lights or warm lights encourages the formation of blooms by triggering plant hormones. Orange or reddish grow lights also give off warmth and produce heat that is needed by the plants to grow. Cost wise, the most inexpensive grow lights amount to $30 per piece. There are different types of grow lights in the market namely incandescent lights, fluorescent lights, T5 fluorescent lights, HID or high intensity discharge lights and LED lights. Incandescent lights are characterized by the heat and high temperature that they give off. And since they can get quite hot, it is advisable that incandescent grow lights as placed at least 2 feet away from the plants. This type of grow light also comes in a color corrected form which are ideal for a small group of plants. Fluorescent light are the most common choice of grow lights for homeowners. This is energy efficient and emits a blue light that encourages a bushy growth. Fluorescent grow lights are safe to be placed near seedlings as they give off a cool temperature. Another type of fluorescent grow lights are T5 lights which is a thin tubular piece of lighting fixture. They have an increased light output compared to regular fluorescent lights but are more energy efficient. 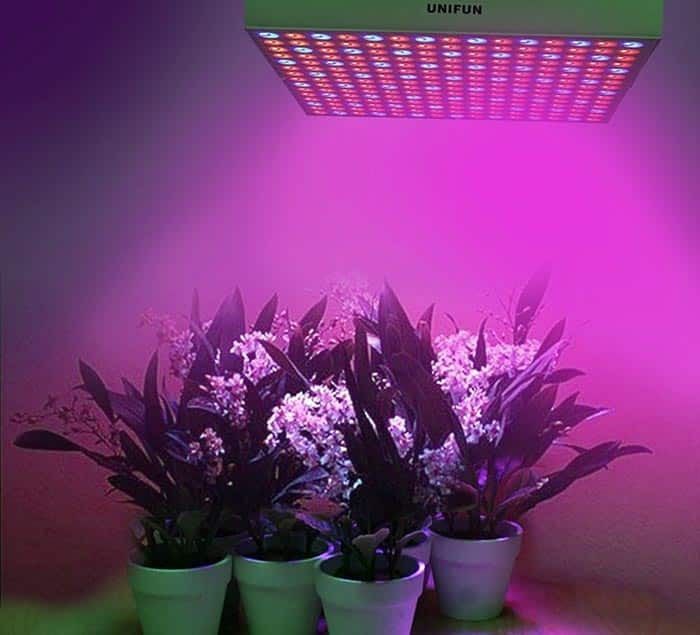 This type of grow light can be placed near the plants as the leaves absorbs them well. HID or high intensity discharge lights are commonly used for commercial applications and large greenhouses. This type of grow lights can cover a wide area because of their high output. Because of the high heat that they emit, they are not recommended to be placed near plants as they have the tendency to burn the leaves. It comes in two types, metal halide and high pressure sodium lights. LED lights, are the newest form of grow lights used for greenhouses. Although small and compact in size, LED grow lights emit an adequate amount of light that has the perfect balance of red and blue lights. It produces just the right temperature that plants need in order to grow well. LED grow lights are practical, easy to mount and re lightweight. When choosing the right type of artificial lighting for your greenhouse, make sure to consider the amount of natural sunlight that the location receives. Some regions have longer days, while others have shorter ones. For those with less daylight, supplemental lighting is needed to ensure that your plants receives ample lighting despite of the existing conditions in the environment. Grow lights are also necessary if you want to continue cultivating your plants, all year round, even during the winter. Greenhouse sprayers are used for distributing water, chemicals and pesticides to plants. There are three basic types of sprayers which are used for chemical application in greenhouses namely : high volume hydraulic sprayers, targeted low volume sprayers and ultra low volume sprayers. High volume hydraulic sprayers is the standard type of greenhouse sprayer that has been used for years. This is considered to be the most effective way to treat a huge problem with pests as it works well with general application. The advantage of hydraulic greenhouse sprayer is that they do not over wet the plants as the application is controlled and is distributed well in fine droplets. Hydraulic greenhouse sprayers are available in different gun and nozzles types which render different flow rates, patterns and amount of pressure. Targeted low volume sprayers are known for their flexibility and better coverage. This type of greenhouse sprayer is somewhere between a hydraulic sprayer and an aerosol fogger. Targeted low volume sprayers disperse chemicals at a flow rate of a liter per minute. Unlike hydraulic sprayers which are used for general application, targeted low volume sprayers are usually directed to their specific target. Its primary purpose if for spot treatments as it gives direct focus to a problem area. This type of greenhouse sprayer also disperses chemicals more quickly than a standard hydraulic sprayer. Types of targeted low volume equipment include electrostatic sprayers, mist blowers, rotary disc atomizers and high pressure cold foggers. Each type is designed for specific type of crop as it propels the right size of particle needed by each plant. Ultra low volume chemical application are commonly known as “foggers”. This type of greenhouse sprayer distributes a small amount of water, which is about 2 liters for every 10,000 square feet. The droplets it releases are also smaller, thus it is more ideal to be used in enclosed spaces to contain the solution within the structure. Foggers use jet propulsions as the source of their air. To determine which type of sprayer is the most suitable for your greenhouse, there are several factors which must be considered. First is the type of crop, the structure and the environment. Vegetable and other edible crops are more suitable to be used with a ULV approach because of the flexibility it offers and the shorter time it requires to apply the pesticides. A heating system is required in greenhouses because they control the temperature that the plants require in order to grow well. Greenhouse heating systems typically make use of fuel oil, wood chips, logs, coal, kerosene and natural gas. Greenhouse heating systems can be divided into two groups : the central and localized heating system. Central heating systems are usually made up of a hot water or steam boiler with a pipe system that is situated in a central location. Typically, this type of heating system is used for commercial and large greenhouses because they are more expensive. They are considered to be a large investment and have large capacities. Localized heaters, also known as forced air heaters are gas fired heating systems or furnaces. This type of greenhouse heating system is versatile and can be used as a starting investment for your greenhouse. Central heating systems such as a central boiler uses large volume of water that is heated to 120 degrees Fahrenheit to 180 degrees Fahrenheit. The water is then distributed through the use of pipes. Steam systems, on the other hand, make use of a small broiler. There is also less plumbing involved and no circulating pumps present in the system. Unlike With the central boiler, using a steam system makes it more difficult to control the flow of steam into the greenhouse. 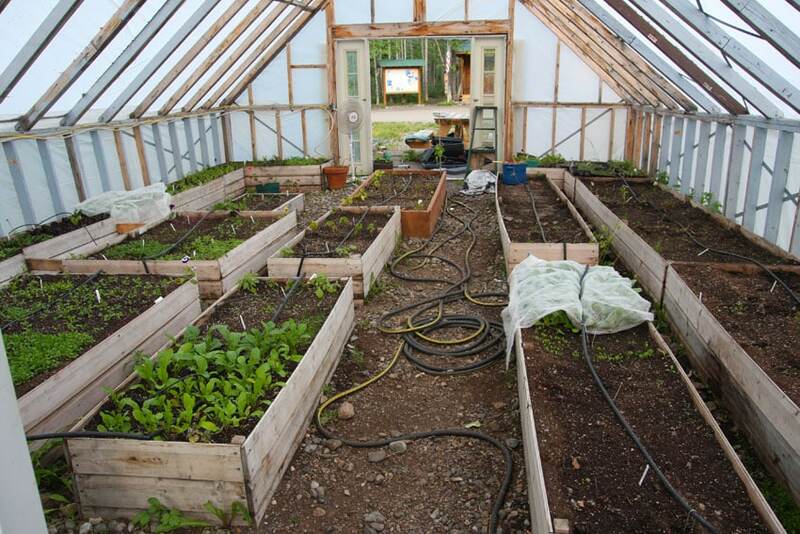 To distribute the steam or hot water to the greenhouse, several ways may be used. These methods are pipe or rail heating distribution, under bench heating distribution, in floor heating distribution, overhead heating distribution and perimeter heating distribution. When choosing the right heating system for your greenhouse, consider the following factors : the type of crops you are growing and the size of your greenhouse. Firstly, the type of crop along with the outdoor temperature of your greenhouse’s location will help you determine the amount of heating you need. Lettuce, for example, needs a cool environment, while basil, on the other hand, needs a warmer environment. The size of your greenhouse also plays an important role. You will need a heating system that is proportional to the size of your greenhouse, whether it may be small or big. Fuel efficiency is another consideration that must be considered since heating systems usually use fuel and fuel can be quite expensive, make sure to get one that will burn the fuel efficiently and cleanly. As discussed earlier, there are several materials which can be used as a covering for greenhouses. These materials range from glass, fiberglass, acrylic, vinyl and polyethylene. Alternatively you can also use a plastic sheet as a covering material. The most cost efficient and affordable greenhouse cover which is available in the market is the “greenhouse plastic”. Greenhouse plastic is durable type of plastic that is used as an alternative to large glass frames. Unlike regular plastic, greenhouse plastic resists tearing and can withstand constant changes in weather. This type of plastic is knitted, rather than being just formed into sheets. 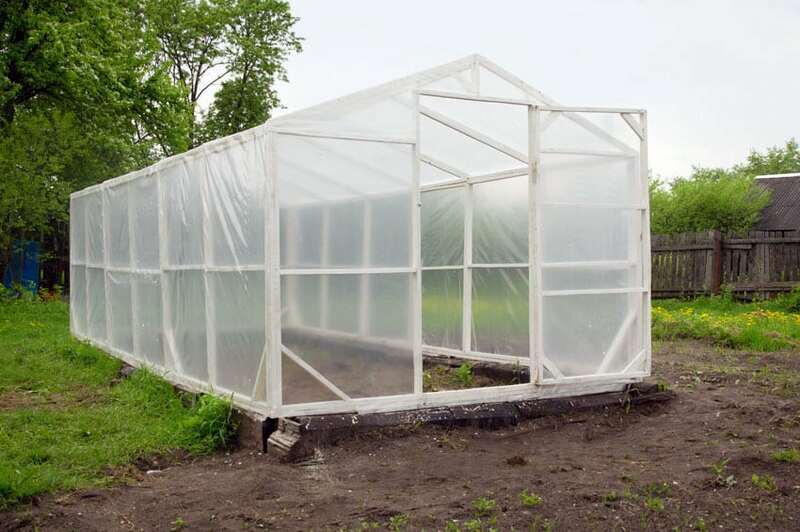 The application of greenhouse plastic is that it is usually wrapped around the frame. It is flexible and works well with a variety of greenhouse designs, sizes and shapes. Greenhouse plastic is commonly made up of four different types of plastics. Unlike other materials, they can also last for two to three years. These four types of plastic are; polyethylene plastic, co polymer plastic, polyvinyl plastic and poly carbonate plastic. Polyethylene greenhouse plastic is the lowest grade of greenhouse cover which comes with a lifespan of one to two years. It comes in two grades, the commercial grade which is used for industrial applications and the utility grade which is utilized for personal and home use. This type of greenhouse cover is repairable. Copolymer plastic, is a type of greenhouse cover which is a grade above polyethylene. Compared to the former, copolymer plastic is more durable and has an extended lifespan of up to three years. But they share the same drawbacks as both become too brittle and weak when exposed to freezing and then subjected to thawing. Some copolymer plastics also have an appearance which resembles glass. Polyvinyl plastic cover is a grade higher than polyethylene and copolymer plastic. Relatively more expensive but is also more durable and has a lifespan of five years, provided that it is regularly maintained and properly cleaned. Poly carbonate plastic, on the other hand, is the most durable of the four types of greenhouse covers. It has the longest lifespan, which lasts for up to ten years. This type of greenhouse cover, comes with good insulation properties as it can maintain heat and humidity well. 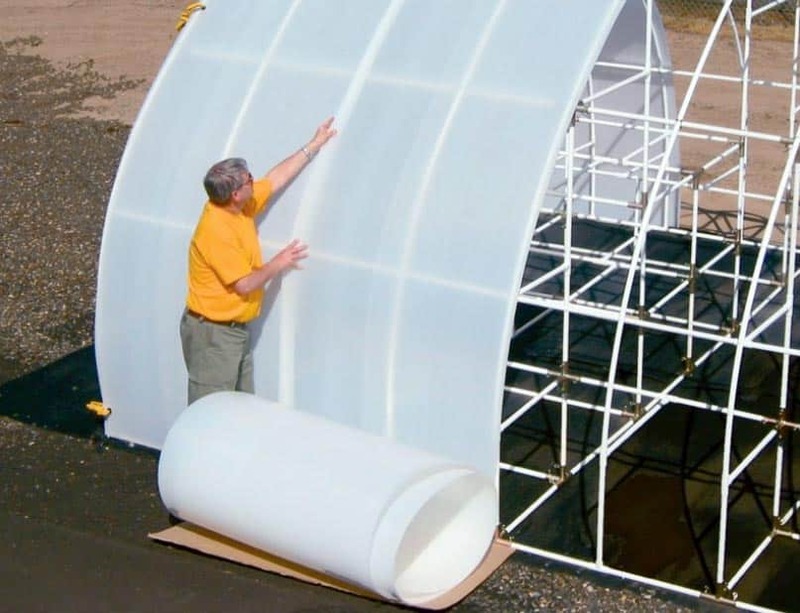 This tunnel like greenhouses is covered in polyethylene film over a tubular steel framing system. Polyethylene is one of the most effective greenhouse covers as it keeps the structure well insulated and it also does not easily break. Filled with different edible crops and vegetables, this steel and plastic hoop house allows you to enjoy your crops all year round without having to worry about elements which may damage it. The plastic sheet cover allows for adequate light to pass through, while keeping ample heat and moisture inside the structure. Indoor greenhouses are temporary structures which allow for growing plants within the confines of the home. An indoor greenhouse is designed in such a way that it can be easily be set up or taken down,as needed. This type of greenhouse is perfect for beginners and for those who want to start with a small greenhouse and eventually expand into a bigger one. Indoor greenhouses are usually sold in kits. It can either be a shelving kit, a tabletop unit or a small freestanding unit. Old furniture like benches and tables can also be used for this purpose, as it can also save you some money. When looking for indoor greenhouses, choose something which is lightweight, quick to install and easy to disassemble. Plastic greenhouse kits can also be considered as these are easy to clean and maintain compared to other materials. Most indoor greenhouses feature a vinyl covering to help keep the humidity, heat and moisture within the structure. The ideal location for indoor greenhouses is near a sunny window or an area which receives at least 6 hours of direct sunlight. The ideal orientation for the indoor greenhouse is to face the west or the south. However, if you desire to place your indoor greenhouse on another area, you can always use grow lights to aid you with the light supply. Grow lights may be purchased at a low affordable price in local home improvement stores and gardening supply centers. This ready made greenhouse is perfect for indoor use and can be placed in any area as its size is just like any standard furniture piece. It is made up of a steel frame and a white reflective lining that distributes heat evenly to plants. It also comes with adjustable shelves which provide flexibility in terms of growing different plants variants. 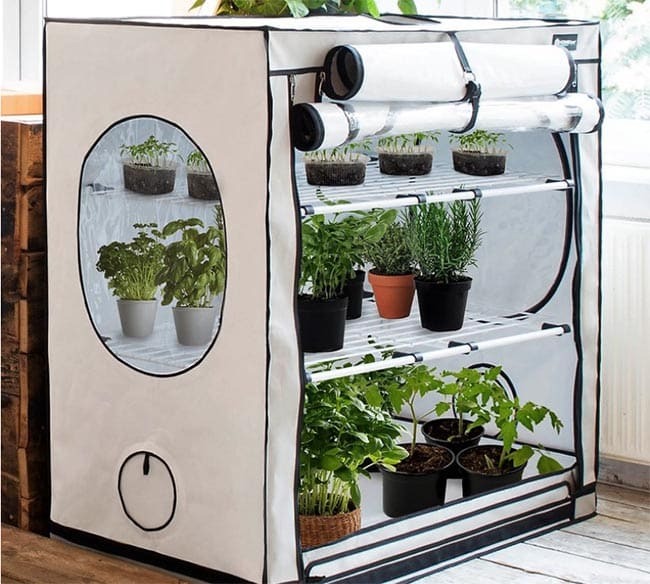 This type of indoor greenhouse is perfect for growing herbs and vegetables near the kitchen, as it gives you an easy and quick access to the crops you need.